I was wondering if your forecast models “compress” as we move into the future? Information spreads more quickly and everything moves faster and faster as we move through time due to advances in technology. Could this lead to contagion spreading from the collapse of Europe more quickly than your current models would indicate? Also, would the plague cycle start to compress as well due to air travel? If we had air travel during the black plague things might have turned out a bit differently. ANSWER: There are many different types of cycles that function differently. Yet what I discovered was something rather important and it goes to the very reason history repeats – because human nature does not change. On the surface you assume that technology will advance things and thereby compress the cycle. I would have thought the same thing. However, this is where allowing the data to guide the theory rather than the theory selectively finding data to justify its assumption is critical. 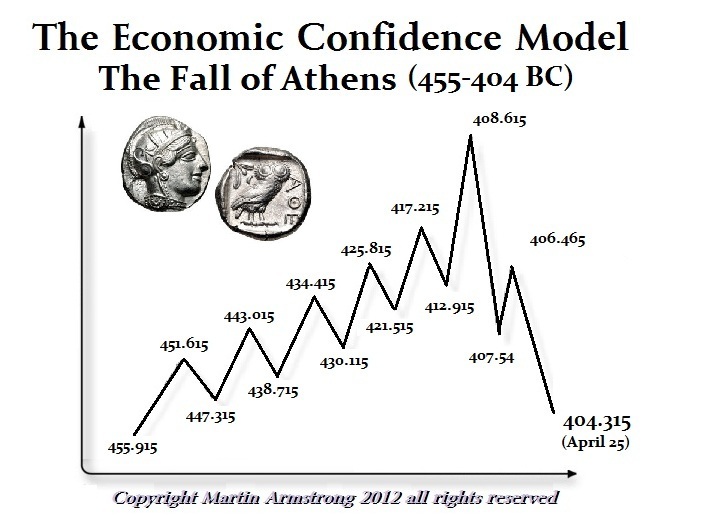 The rise and fall of Athens from the Democratic revolution to its fall to Sparta was 51.6 years. Even when we look at Rome during the 3rd Century when Diocletian (284-305AD) reformed the monetary system after the collapse, that reform lasted the same amount of time – essentially 51.6 years. The timing NEVER changes, which is interesting. 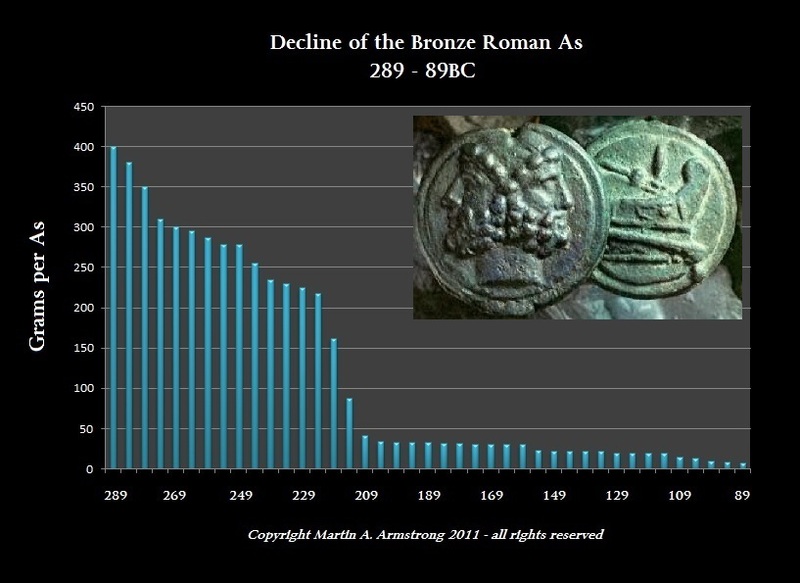 Putting together the monetary system of the world was the key to everything. This answered that question about compression and how do empires really rise and fall – is it like a slow landing of a 747 nice and gradual, or is it in the blink of an eye? When a system falls, it collapses rapidly and this takes society by surprise for they do not believe this is how everything functions. The fall of Communism shook the world. All the CIA plots could never undermine China and Russia in such a manner. 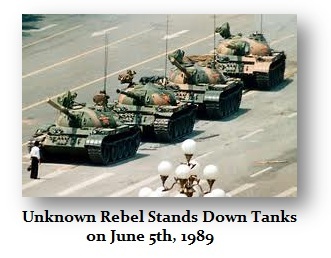 When China began with the demonstrations in Beijing on June 5th, 1989, the world shook indeed. Then the Berlin Wall went up August 13, 1961 and it fell November 9, 1989 or just over 28 years. Communism fell in Eastern Europe 1989–1990 and then came the dissolution of the Soviet Union in 1991. With respect to China, the birth of the People’s Republic of China was 1949. In just 27 years from the start of China moving toward a capitalistic system began to unfold. It was 1976 that marked the start of post-Mao reform and argue that China basically became a market economy by the end of the 90s before it joined the World Trade Organization in 2001. Therefore, the Chinese economy became capitalist in two steps. First was the reform by the government that gave a taste of freedom to the people. The second phase was the 1989 Student Movement. By 2001, Jiang declared in his speech celebrating the eightieth birthday of the Communist Party that private entrepreneurs, private business owners, self-employed artists, white-collar professionals employed by foreign companies and joint ventures are welcome to join the Party. The power base of the current regime has shifted entirely away from its traditional constituency to the new social strata that represent the advanced force of production and new culture. 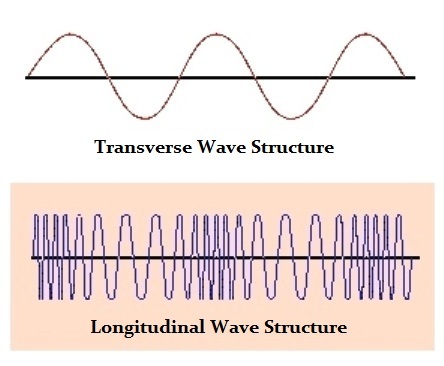 The question have cycles compressed? The answer is NO! If we look at the sweeping political reforms of phase II in China that erupted on June 5th, 1989 and then look at the fall of the Berlin Wall November 9, 1989, we are looking at about just 4.3 months. 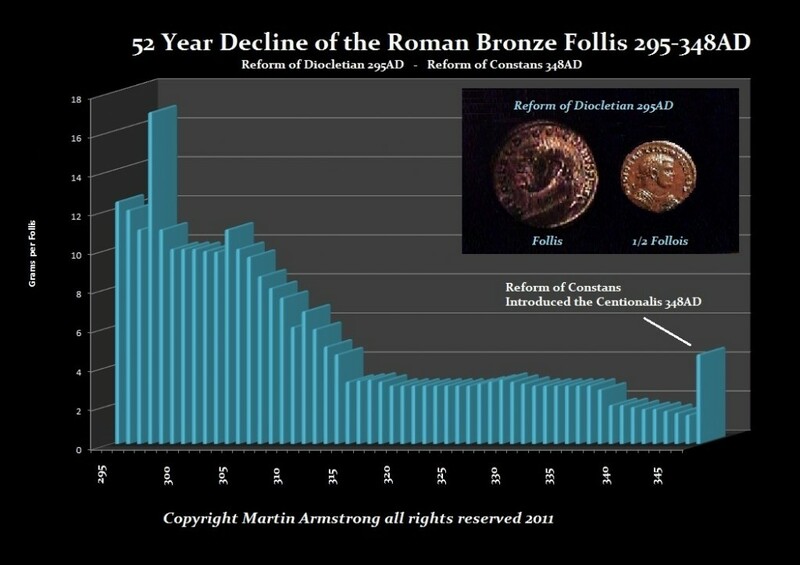 In ancient times, the Roman Republic began overthrowing their king in 509BC and by 508BC democracy emerged in Athens. The overthrow of monarchy swept the region. This event inspired the American revolution as well against monarchy. Sure today information may travel in hours compared to a few days for a ship to sail from Rome to Athens. That is not the question. Once that information spreads, it still takes the same amount of time to sink in. So it does not seem to matter how fast we get the info there, it still takes the same amount of time to move the people. I have found no evidence of a compression. Only that volatility will rise with stronger convergences.